Remember when you always had to drive to your neighborhood bank in order to cash in your paycheck, your birthday gift from your grandparents, or your reimbursement? While the in-person interaction with the bank teller may have brightened your day, making that extra errand out can also be a hassle with an already busy schedule. Most often, you’ll already need an account set up in order to deposit your check. Whether it’s your actual bank or another online cash account, adding funds with paper checks is quick and easy. Be sure you sign the back of the check as you take a photo of it to deposit online. So how do you transfer a check right to your online account? Here, we share six easy ways you can cash a check online. Perhaps one of the most convenient ways to cash a check online is using the mobile deposit services from your current bank. Most national and larger-scale banks have mobile apps where you can keep track of your account and get important notifications. 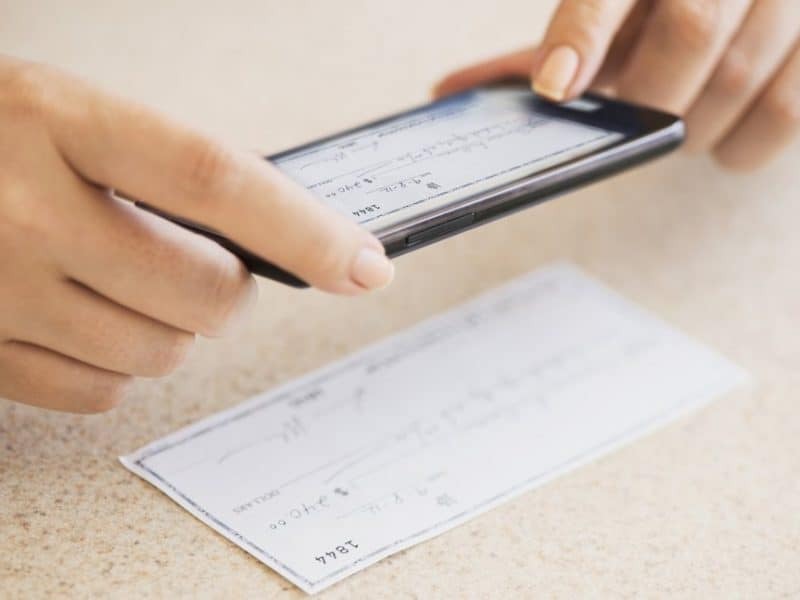 These apps also often have a mobile deposit capability that allows you to take a photo of the front and back of your check and upload it to your account. Most banks, such as Chase, Bank of America, U.S. Bank, and many others offer this service for free. While it may depend on when you make your mobile deposit, most often you can see your deposited check in your bank the next business day. Using your bank’s mobile deposit benefits keeps you from paying extra fees to get the convenience of mobile check deposit and the service is kept all in one organization. Check with your local bank provider to see if they have a mobile deposit option you can take advantage of. With an account with Boost Mobile, you can connect your phone to your finances with easy-to-use options that get you rewards and makes spending and saving easier. This app is much more than just a check deposit resource. You can also find great deals local and online, send or request money and have access to a mastercard for convenient spending. By taking a photo of the front and back of your card, you can easily get cash in your account. If you can wait about 10 days to get your account, there’s no fee. Otherwise, you’ll pay a small fee to get access to your cash instantly. You can also avoid paychecks altogether with direct deposit options with Boost Mobile Wallet as well. Take your visit to your local check cashing store all online with a free mobile app. Like other apps, your local check cashing store’s app works similar to the in-person visit, with the added convenience of cashing right from your phone. While there are fees associated, you’ll get that added ease and save time by going online. If you have a PayPal account, adding funds with a paper check is quick, easy and doesn’t have any extra fees to account for. Like a bank’s mobile deposit service, you can take a photo of the front and back of the paper check and upload it right to your account. The app for your phone is also free and also allows you to monitor and track your payment activity and other important account information. There are a few limitations to this method, including needing to wait 2-3 business days before you can have access to those funds as well as a $1,000 daily limit. Yet PayPal is a popular and easy-to-use platform to cash a check online. This free app allows you to get your cash when you need it, right from your phone. Get access to your money from paychecks and personal checks at anytime. Choose to put your funds toward your bank account, a prepaid card or even right to your PayPal account for easy online payments. If you want your check deposit to go to different accounts, you can also split up your check to go to the accounts you want. This app also offers additional perks like referral rewards and easy bill pay services. Go Bank is another mobile app that allows you to quickly and easily deposit your paper check so you can use your funds you’ve earned or received. Available on both the App Store and Google Play, this easy to use app saves you time and the extra hassle of making it into the bank or check cashing store. Keeping track of your money is even easier with a Go Bank app that lets you check your balance, see transaction histories, find ATMs and of course, deposit checks right from your phone. Build wise financial decisions with budgeting tools and other savings resources that can help you get where you want to be with your money. You won’t need to worry about any additional check-cashing fees so you can keep more of your money. Save time and extra fees from visiting your bank or check cashing store. Check out the method that works for you to redeem your checks right from your phone.